Artificial Intelligence is a branch of computer science dealing with the simulation of intelligent behavior in computers. The goals of AI research include reasoning, knowledge, planning, learning, natural language processing, perception, decision making, and the ability to move and manipulate objects. The philosophy of AI include	Ethics, Existential risk, Turing test, Chinese room, and Friendly AI. 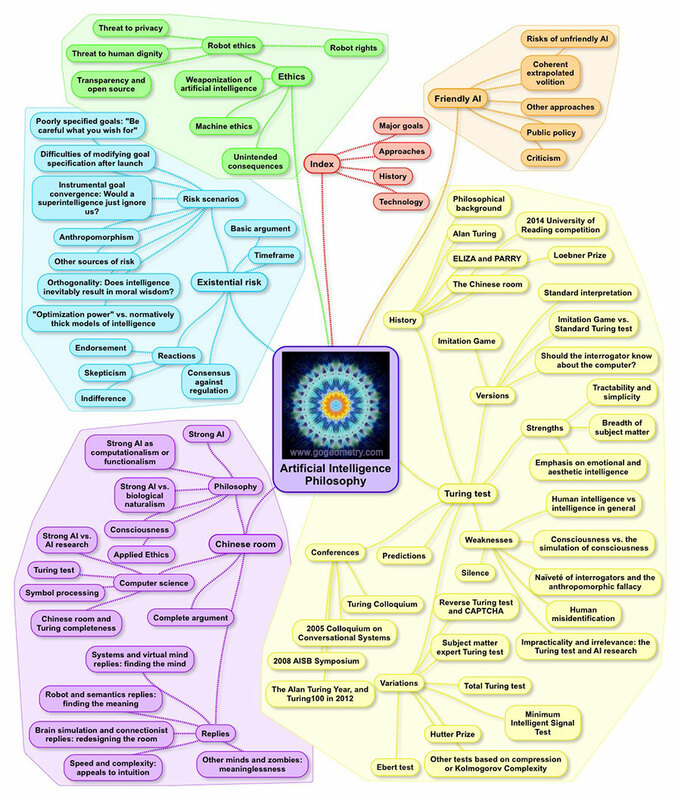 Mind map based on Wikipedia: Artificial Intelligence and Wikipedia: Outline of AI as of October 15, 2017. Graphic organizers are visual representations of knowledge, concepts or ideas. A mind map is a hierarchical diagram used to visually organize information, concepts and ideas.